For the English actor, see Geoffrey Palmer (actor). 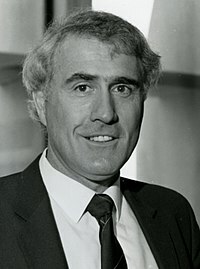 Sir Geoffrey Winston Russell Palmer (born 21 April 1942) is a New Zealand politician. He served as the 33rd Prime Minister of New Zealand. He served as Prime Minister from 8 August 1989 to 4 September 1990. Palmer was born in Nelson, New Zealand. ↑ "Former NZ PM to lead Gaza flotilla attack probe". ↑ "Palmer to head UN flotilla inquiry". The New Zealand Herald. 3 August 2010. This page was last changed on 13 January 2018, at 06:10.